Caroline and Kelly themselves are similarly well-scrubbed. Line is very lively but wholesome; her mischievous streak is never malicious but aims to push her friends to do things they might never have tried. As when she pushed Kelly to invite a handsome new neighbor to the season kickoff party at the dust-free barn Line’s dad owns, or when she impulsively challenges her teammates to partake in a pizza-eating contest, which move doesn’t sit well with her no-nonsense volleyball coach, Kathy Bresnahan, played by Helen Hunt. Coach Bresnahan is particularly irked because her team was the state champion of 2010, and “Bres,” as her charges call her, doesn’t want that to be a fluke. The reason the movie’s set in 2010 is because it’s based on a true story, and the true story gets rolling with a tragedy: Caroline’s death in a driving accident just as the season’s getting underway. The movie’s particular cushy sheen, engineered by director Sean McNamara, means that of course the accident is not depicted. But Caroline’s character has been well enough embodied by Yarosh’s performance that the loss registers, and the devastation of her teammates, not to mention her surgeon father, played by William Hurt, is felt. To a certain extent. Given the title, you know that this movie is not selling suspense but inspiration. The dispirited team can’t shake off the loss at first, but thanks to an example reluctantly set by Kelly, it starts to find its footing again. The determination to win “for Line” pushes everyone, until the coach asks the near-impossible: that the team clear the board and get to the quarter-finals by taking fourteen games in a row. 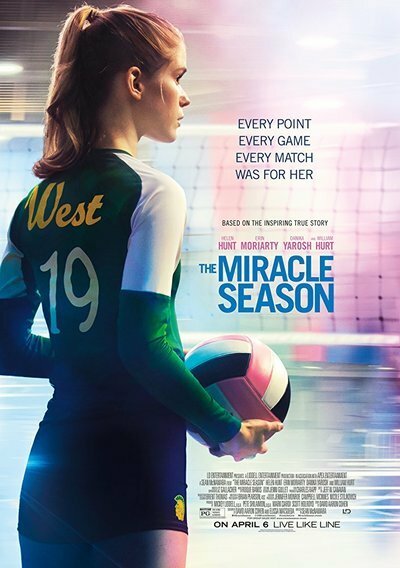 I imagine it’s hard to simulate volleyball games, and I don’t have to imagine in order to remark that they are difficult to make exciting on film. So this movie goes for the heartstrings and tear ducts more than the sports-conscious. The results are pretty mixed. God bless William Hurt. The script gives him every excuse to phone in the part of Caroline’s father by obliging him to speak lines like “I may be the surgeon, but you’re the hero out there.” Despite that, he’s straight and genuine throughout. As is Hunt, whose character’s emotionally shut-down façade gives way in a powerful scene near the end. Problem is, every time the movie gets near an authentic emotion, it barely pauses before making a run to the next Katy Perry song cue. (Seriously, both “Roar” and “Firework” are featured herein.) Given the care that the adult and teen actors invested in trying to honor their real-life counterparts, this feels lazy. If you like Katy Perry songs that much, you may feel differently.